Calling out to space for up to 12 minutes? Yeah, that's pretty rough on juice. 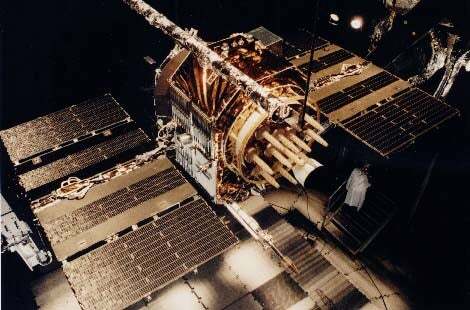 NAVSTAR satellite, ready to join up with at least two others to drain your phone. Image via Wikimedia Commons. File this under "blog posts that mostly just point at a thing and ask you to look at/click them": a Quora answer to the question of why GPS eats so much more battery life, so much more rapidly, than anything else on your phone (other than flashlight apps, that is). A Google engineer answers the question of GPS' power hunger at Q&A site Quora. The answer from Robert Love, too, does not drill down so far as to become opaque to non-programmers, nor does it just spout obvious truisms ("Satellites! Space!"). Note: Love's answer is the top answer in that Quora thread, so you should be able to click on to see it, even if you don't sign up for an account. Want to see beyond just the one answer? Per Adrian Roselli on Twitter: "Append /?share=1 to the URL and you'll bypass it." GPS is expensive because it is a very slow communication channel—you need to communicate with three or four satellites for an extended duration at 50 bits per second ... Mobile devices such as Android and the iPhone achieve their battery life largely because they can aggressively and quickly enter into and exit from sleep states. GPS prevents this. Even with (data-assisted satellite acquisition) A-GPS, using your GPS is a noticeable battery hog. ... Compounding the cost, most mapping software is processor-intense. A well-designed app can make a significant difference here; Google Maps boasts several optimizations to reduce battery consumption from GPS usage. Open question: is the iPhone's overall battery life better with each successive release?